Behind the Scenes at Beechwood Inn – North Georgia: Take a peak behind the scenes at Beechwood Inn. See the magic! As you drive up to Beechwood Inn you will be greeted by Rusty, our “Great American Dog” Sculpture. As you drive past Rusty, the Historic Beechwood Inn comes into view through the forest, standing nobly for 102 years. When you enter the front door, you will notice how welcoming the interior of the inn is and how warm and friendly the hosts are. When you enter your guest room, you notice the special touches in the room – the way the pillows are fluffed, the fresh flowers and bottle of wine you requested are on the side table, and how everything is sparkling clean! At breakfast time, you notice how all the place settings are set just perfectly. 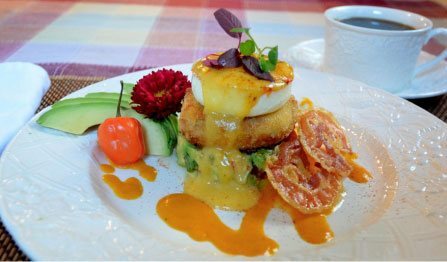 And when breakfast arrives at your table, the presentation is so beautiful you almost don’t want to touch it, the aromas are mouth-watering, and the flavors of the breakfast food are delicious! This all does not just happen. 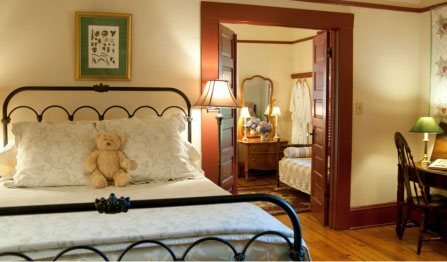 Every aspect of your visit to Beechwood Inn is staged and prepared by our friendly and dedicated staff. Lots goes on behind the scenes. Our Innkeepers, Gayle and David Darugh, have been doing this now for 20 years. They are assisted by a devoted and wonderful staff – that understands that tourism means weekends, holidays and special occasions. 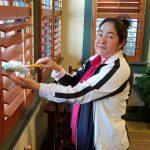 Your guest room sparkles because of Olga, now with Beechwood Inn for 4 years. In addition to the thorough cleaning each room gets after guests check out, we also deep clean each room every other month. That entails moving all the furniture, cleaning light fixtures, lamps, moldings, baseboards, drapes, blinds – pretty much everything. All this cleaning occurs behind the scenes but the magic shows in the room. The luxurious linens do not clean themselves! The sheets are sweet-smelling and crisp, and the towels are soft and fluffy all because Olga, along with our other staff, are managing the laundry magic. Olga also assists in the kitchen every Saturday night offering dishwashing and cleanup. 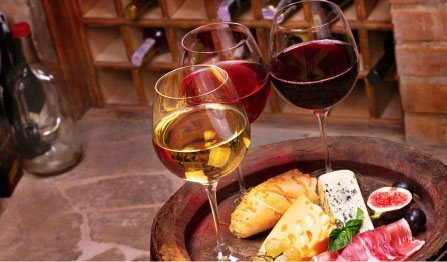 Each evening as you look forward to Wine-Thirty, Assistant Innkeeper Vicki is planning appetizers and making sure the wine is chilled. Owner Gayle Darugh is greeting guests and offering concierge assistance to make your visit more interesting. Gayle has been on our Tourism Development Authority for over 10 years, so she knows lots about our corner of North Georgia. Oh, did I mention Beechwood Inn has its own bottling of wine, so our innkeepers David and Gayle are also wine-makers. That’s a little behind the scenes magic of its own. While you are gone for dinner Vicki will be setting tables for breakfast. As she sets the places, she is double-checking for watermarks and making sure all the napkins are folded just right! And also that all the breakfast crumbs have been swept off the floor. Breakfast preparation begins well in advance. Assistant Innkeeper Renee will keep track of our occupancy to ensure we have plenty of freshly made muffins, scones and cookies. 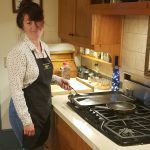 Renee can be found in the kitchen chopping veggies for a tasty frittata or cutting fruit for the breakfast parfait before she leaves for the evening. And when the sun rises, one of us will be first in the kitchen to prepare delicious locally-roasted coffee. You can really wake-up and smell the coffee! And after you savor the aroma of coffee, you begin to catch the wonderful scents of breakfast cooking. Renee or Vicki will be in the kitchen, spatula in hand, tending some hickory smoked bacon from a nearby farm and flipping local organic eggs. Do you smell pastries fresh from the oven? All this preparation happens behind the scenes. In addition to this daily effort, every week we offer multi-course farm to table dinners. This entails menu planning and working with local farmers to make dinner happen. 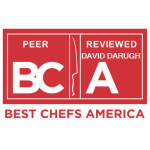 We also offer cooking classes, educational wine tastings, small weddings and holiday parties. To us, it seems like we are always busy, but we love the life and appreciate the many compliments offered to our hard-working team. During our slow season (winter) we all work on our maintenance list of things that need to be done to keep Beechwood Inn fresh and impeccably modern. The Inn is 102 years old, but we want her to feel and appear updated and fresh. This winter Renee and Vicki painted the dining room walls, its floor (ancient heart pine), the trim and also the inn’s entire pantry. Last winter Renee painted guest rooms, stairwells and hallways. The large basement got a thorough cleaning and the attic, our storage space for seasonal décor, was cleaned and reorganized. We each offer special interests and strengths. 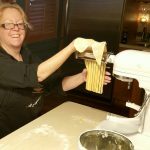 Renee loves experimenting with new pastry, breakfast and cookie recipes. David enjoys sipping new wines to add to the inn’s cellar. Vicki and Gayle are constantly exploring new products for our gift shop and providing new guest services that add to your experience. Vicki likes to explore our property management software and other computer resources to find better ways to measure our success and expand the inn’s online reach. 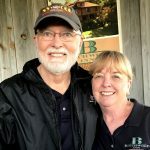 Vicki and David like to author blogs that spotlight things to do, places to explore and other businesses you will find of interest. When “it’s show time” you, our special guest, reap the benefit of all the background work! Enjoy the beautiful grounds, sip a glass of wine, feel welcome in a well-appointed and sparkling clean room, and after a wonderful night’s rest, fill-up on a delicious breakfast where all the preparation was started behind the scenes. The perfect guest experience does not happen by magic – it results from special behind the scenes activity of a great team! 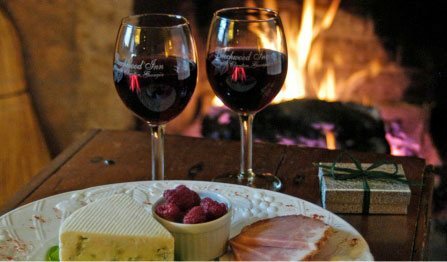 Make your reservation now to experience the magic of a stay at Beechwood Inn – Georgia’s Premier Wine Country Inn.